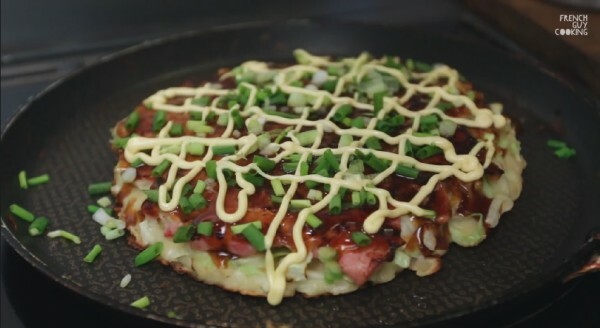 Today’s food request was submitted by Noriko, from Japan: she asked my take on the mighty Okonomiyaki which literally translates into “whatever you like, grilled”. 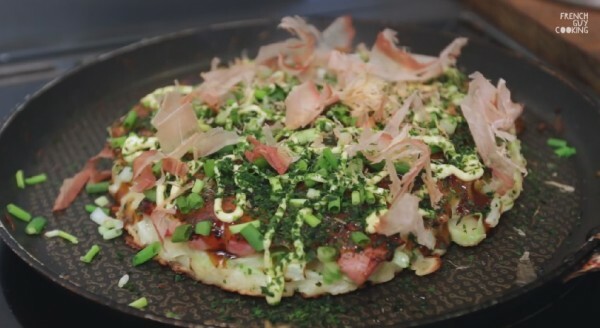 This Japanese savoury pancake may contain a variety of ingredients from fish, to meat to veggies so much so that it is also known as the Japanese Pizza. Being so versatile I couldn’t resist: starting from a very simple and common batter made with flour, water or dashi (similar to fish stock) and shredded cabbage, I made both a more traditional version and a twisted, American take. In a bowl combine one cup of flour with one tablespoon of potatoes starch. Into a 3/4 of a cup of water dissolve a teaspoon of dashi and pour it in the bowl. 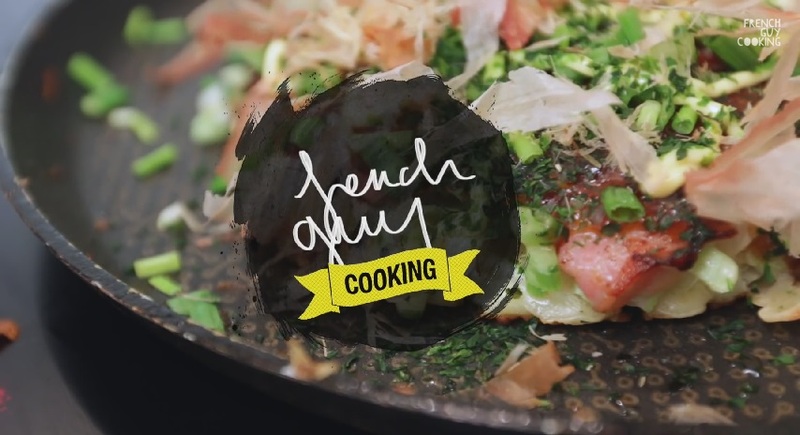 Mix well until you get a silky texture, adding a bit more flour if it is too runny. 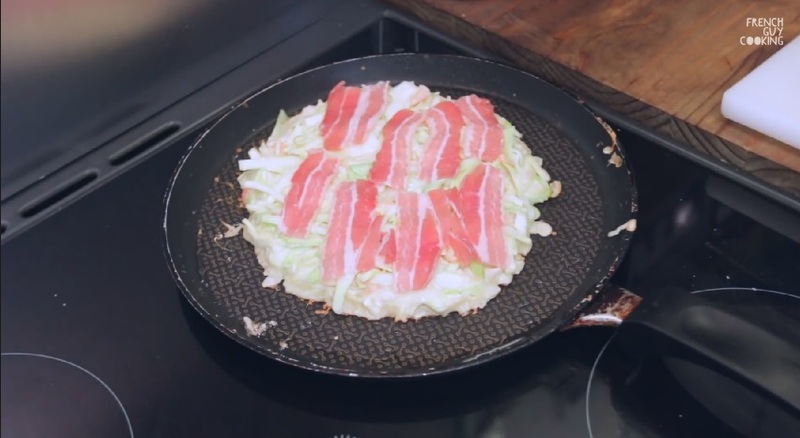 Complete the basic batter adding a big handful of thinly sliced cabbage, a small handful of chopped onion, two eggs, salt and pepper. 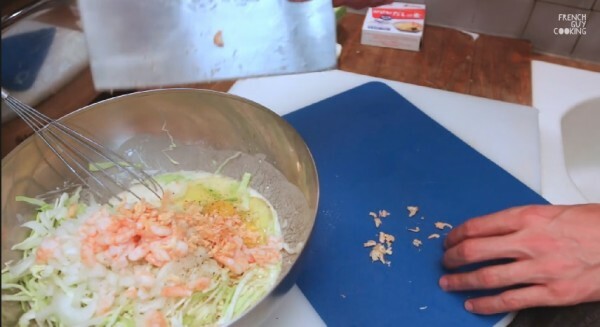 To the base add a handful of roughly chopped shrimps, pickled ginger and dried shrimps. Combine everything gently until everything is well coated in the batter. Glaze the top of your pancake with Okonomiyaki sauce. If you don’t have it you can prepare my cheat version of it: mix three tablepoons of ketchup with one of Worchestershire sauce and one tablespoon of soy sauce. 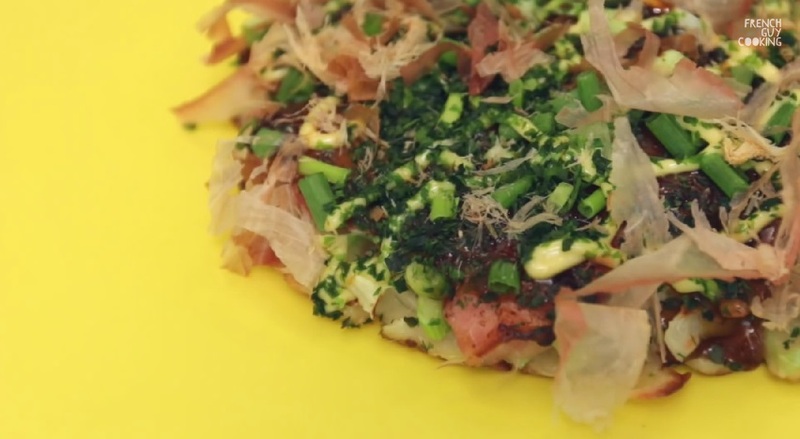 Spread this sauce on top of the Okonomiyaki and sprinkle it with finely chopped spring onions. Criss-cross it with light mayonnaise, a sprinkle of aonori (a dried, green seaweed) and a small handful of katsuobushi or bonito flakes.